Holiday Driving Breakdowns Shouldn't Bring You Down. automotive break down is always an inconvenience. Unfortunately, according to the National Highway Traffic Safety Administration, about 4,000 pedestrians were killed in 2009 when struck by an automobile. An inconvenient breakdown can easily become a life threatening event if the proper safety precautions are not taken. With many of us traveling to visit family for the holidays, this may be a good time to review some simple break-down rules. 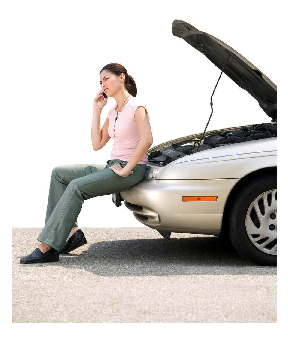 First, and foremost, the easiest way to prevent a breakdown is proper car maintenance. Change your oil regularly, check fluids, change your battery every two years, and replace tires promptly. The easiest way to keep up with the maintenance is to simply take your car in to a Jiffy Lube (or local equivalent) every three thousand miles or so. They will make sure your car is running in tip-top shape, and that nothing has been overlooked. They even fill your tires with air if necessary! Jumper cables - or better yet, a battery booster pack so you won't have to rely on the kindness of strangers. Antifreeze - in case your car runs low or develops a radiator leak. A first aid kit - Always a good idea. Fix-A-Flat Tire Sealant and a tire compressor - It will save you having to use your spare tire. It can be rather scary to get out of your car on the side of the highway while cars pass you at over 65 mph. If your car breaks down on the highway, try to put as much distance between you and the highway traffic as is reasonably allowable. Pull as far off on to the emergency lane as you can. If there is a safe un-paved area next to the emergency lane, it's best to pull into it. Most collisions between disabled vehicles and traffic occur because drivers decide to stop in unsafe conditions. Even if you experience a flat tire, do not stop unless there is a safe area which you can comfortably work in. That may mean driving on the rim for a short time, but it's worth the cost of replacing a rim if it will prevent an accident (and could possibly save your life). Once you have pulled off the road, remember to set up a warning device to help other drivers stay clear of your vehicle. 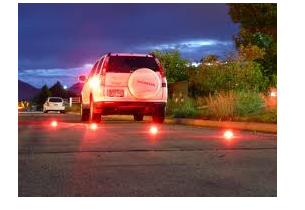 Signals such as flares and reflective triangles should be placed several yards away from your vehicle to warn oncoming traffic of your location. It will also make it easier for road-side assistance to find you if you have requested their presence. Hazard lights are certainly important, and should be turned on, but some drives can confuse them with running lights and may accidentally steer in to your emergency lane. The best practice is to always carry emergency signaling equipment, in addition to using hazard lights. If for some reason, you can not move in to a safe area, then do not attempt to fix your car. Call for help. 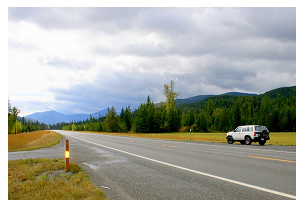 Road side assistance is available throughout the country, and most highways have a patrol that drives by periodically. It may take longer, but you'll stay safer if you simply wait for a tow-truck to move your car to a proper facility. Being stranded with a disabled vehicle can be pretty frustrating, but by following a few easy safety precautions, the life you save may be your own. What are some of the tips you have for other readers taking long driving trips this holiday season? Let us know by leaving a comment below!